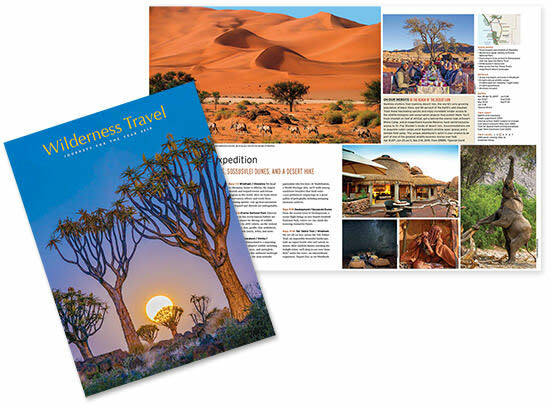 Wilderness Travel is a pioneering leader in the Adventure Travel industry, dedicated to bringing you innovative and active travel experiences for 40 years. With more than 200 small group and private journeys in 75 countries throughout the world, we offer a trip for every adventurous spirit—from African safaris to hiking odysseys in the Alps to expedition cruises in Antarctica. We invite you to join us! Our Cruise Collection for 2020! Get inspired for you next journey with our 2019 Catalog of Adventures! Get inspired for your next journey with our 2019 Catalog of Adventures! With vibrant award-winning photography and over 300 journeys around the world, it is truly a Dream Book that will grace your coffee table and feed your wanderlust.